Christa Mercado, a fleet service coordinator at UC Santa Cruz, marched alongside her coworkers, fellow union members and allies at UCSCs west entrance at corner of Heller Drive and Oakes College on Jan. 10 in a strike that blocked off this entrance and the main entrance at High Street and Bay Drive. About 100 people, split between the two entrances, donned plastic-wrapped signs and diverted blocks of cars and buses through the rain. Mercado and others went on strike to represent the CX-Unit of Teamsters Local 2010, currently in a contract negotiation with the UC. The CX-Unit is made up of UC administrative, clerical and support staff — including childcare workers and human resources — making up just under 12,000 employees at the UC. Strikers demanded a livable wage to account for the high cost of living and respect during negotiations as a specialized workforce. Mercado grew up in Santa Cruz and has worked for UCSC for over 10 years. She said her current salary, as is the case for many others in her union, is unlivable in an expensive area like Santa Cruz. The average annual salary for a university clerical worker is $47,300 which is slightly more than the state average of roughly $39,200 according to a statement released by the UC, but the cost of living in cities like Santa Cruz, Los Angeles, Berkeley and others affected by UCs is significantly higher in contrast to the rest of the state. Teamsters Local 2010 and the UC have been negotiating a new five-year contract since April 2016, even passing the contract expiration set on Dec. 9, 2016. 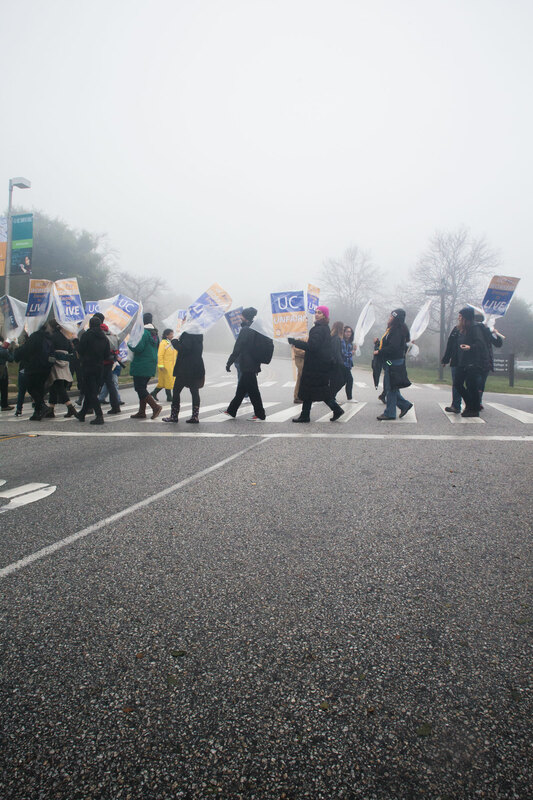 The union expressed frustration with wage increase suggestions they consider to be too low. The original contract offered a less than 15 percent wage increase over five years. To challenge the UC’s low negotiation, the union organized a UC-wide single day strike on Jan. 10, concluding a five-day protest at UCLA. CX-Unit members at the single-day strikes were provided $100, compensated by the Teamsters Local 2010, if they chose to join the picket line. The clerical workers joined Teamsters and received their first contract with the UC five years ago, said Timothy Mathews, a research analyst with Teamsters Local 2010. Mathews said he believes, “the university has been taking advantage of this group because of what their makeup is,” — 81 percent women and 63 percent people of color. The UC is now offering an additional annual three percent guaranteed increase, bringing the new raise to 12-18 percent over six years, according to the Teamsters Local 2010 platform. However, the union and its members saw this offer as insufficient. Workers are also concerned with a proposed change to their healthcare plan and the future of pensions. In their previous contract, members had a guaranteed pension retirement program, but the university has now attempted to move toward a 401K style plan. Beyond the pay and benefit packages offered thus far, much of the contention in the current UC-wide strike revolves around the university’s negotiation tactics. When hundreds of skilled workers from UCLA’s Teamsters union engaged in a five-day strike beginning on Jan. 6 the university attempted to deem the strikes illegal when they heard of plans for the demonstration. 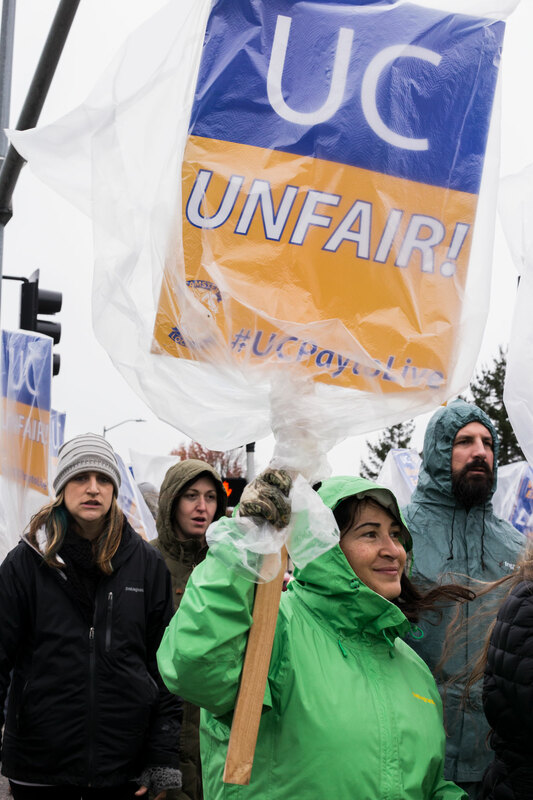 UC administration filed an unfair labor practice complaint with the California Public Appointment Relations Board, and the court ultimately ruled in favor of the union, deeming the strikes legal. The UC stated in a public notice it did not condone the UC-wide strikes and said “a strike is also counterproductive to negotiations.” Ricardo Vazquez, director of media relations for the UC Office of the President, confirmed negotiations will continue. 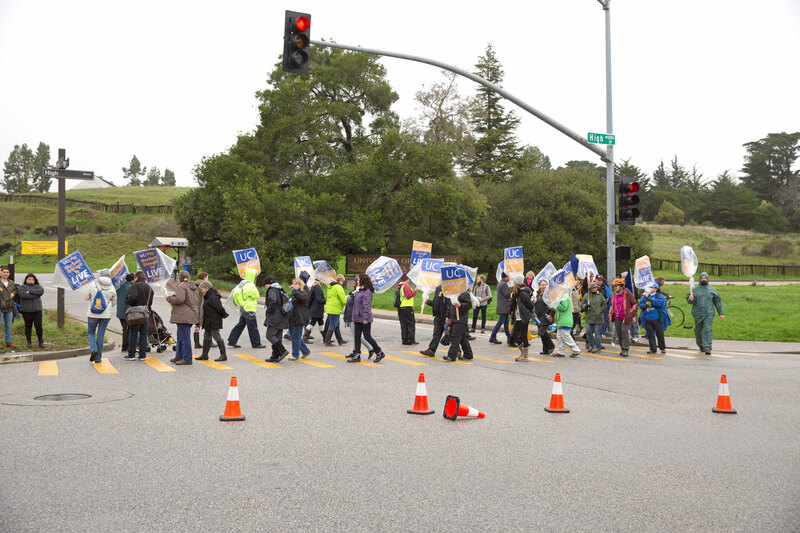 The union contacted local and UC police forces prior to striking, but UCSC Police Department (UCSC PD) Chief Nader Oweis said blocking the two entrances on campus was illegal because pedestrians are not allowed to impede traffic and school operations. Oweis said the university chose to allow the strikers to stay, and UCSC PD monitored the area to ensure safety and to direct traffic. 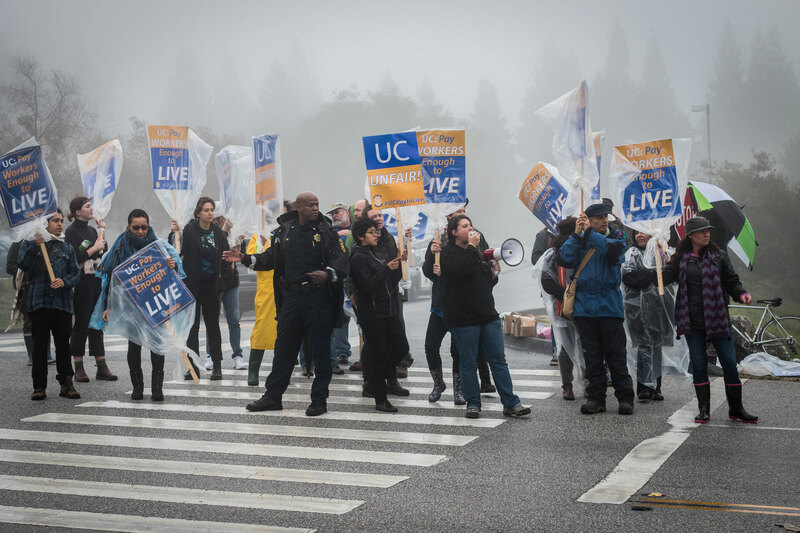 Christa Mercado, who works with police officers regularly as part of her job at fleet services, said the UCSC PD should have stood in solidarity with the clerical workers given that they too are currently in contract negotiations with the university. The UC Police Department (UCPD), organized under Federated University Police Officers Association, had its contract expire on Dec. 31, 2016. Students who were at the protest also emphasized the need to support the union efforts, pointing to the solidarity and support they have received from workers in the past. Caceres stressed students should continue to return the favor, insisting students and workers are more powerful together in a common cause. During the UCSC protest, strikers even chanted “student power” to passing cars, trying to motivate students to join the fight instead of crossing the picket line for class. Union representatives highlighted the similar adversities students and workers face by comparing tuition hikes and dwindling students resources to the workers’ stagnant wages and mounting work expectations.